When BP Alaska decided to build a $7.1 million Energy Center designed to support non-profit agencies throughout Alaska and promote understanding of Alaska’s oil and gas industry, they called upon Studio360 to develop multimedia tools to help tell the story. Since the kiosks we’re custom fabricated specifically for the Energy Center they needed to complement the center’s design as well as be functional for a broad cross-section of users. Studio360 was able to integrate both of these design elements successfully into the project. The project has been an overwhelming success and BP has since decided to repurpose the content for a CD-ROM which will go out to all the schools located in Alaska. Working with Studio360 on this project was a delight. They were very professional, extremely cost-conscious, and yet insistent on the best quality throughout the project. They quickly became knowledgeable of our industry and presented the important information in an interesting and educational way. 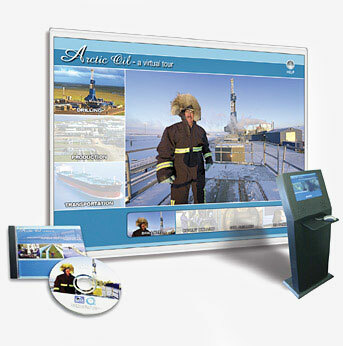 The 360 photo framework helps the user to feel as if he is right there — on a drilling rig, at the Port of Valdez, in the Gulf of Alaska, or any of the other locations in the tour. Users give the tour rave reviews.